Pakistan Navy PN Commissioned Cadet Pakistan. • Physics, Maths and Chemistry. • Physics, Maths and Computer Science. • FSc pawn appearing candidates with at Iraq 65% marks in part-I can also apply. However, they have to provide a hope certificate from the head of respective college/institute. 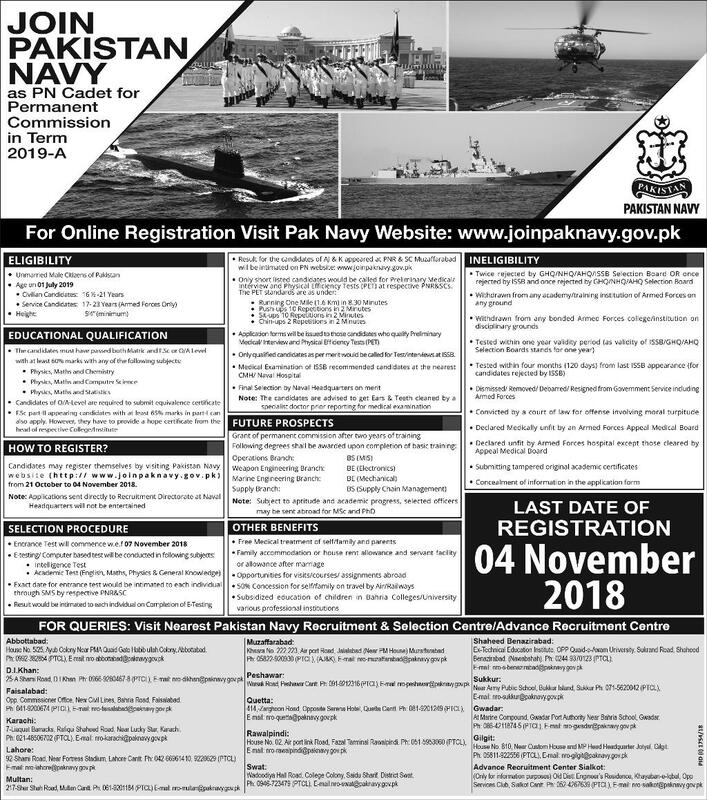 Candidates may register themselves by visiting Pakistan Navy website (http:// www.JoInpaknavy.gov.pk) from 21 October to 04 November 2018. Note: Applications sent directly to Recruitment Directorate at Naval Headquarters will not be entertained. Nice Post !! I was Looking for this <a href="https://www.nayapakistanjobs.com/p/join-pak-army.html>Pakistan Army Jobs</a> - Best Website for Jobs ! !